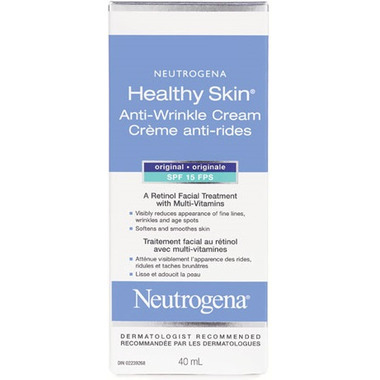 NEUTROGENA® HEALTHY SKIN® Anti-Wrinkle Cream SPF 15 is a dermatologist-recommended daily moisturizing cream clinically proven to start to visibly reduce the appearance of fine lines and wrinkles in one week, for skin that looks younger and healthier. This hydrating formula contains retinol, the purest form of Vitamin A, to work deep within the skin’s surface where wrinkles develop. A combination of Pro-Vitamin B5, Vitamin E and special moisturizers boosts moisture levels while softening and smoothing skin. Oil-free formula absorbs quickly and won’t clog pores. Broad-spectrum UVA/UVB SPF 15 sunscreens help protect against the sun's harmful rays. First off, please please do not use this as your primary sunscreen- SPF 15 is not high enough. It's unfortunate that they didn't put SPF 30 in this product, that would make it better. I always use a SPF 30 or 60 on top. This product has been part of my lineup for probably 3 years now, and it works for me. Fragrance free, little retinol; I definitely feel it has been worth it and will continue to use it. Just started using this product. Feels good when you smooth on to skin and gives face a healthy glow. It is also SFP 15 which I really like. This cream works well on my aging skin, and I'm delighted to have it delivered to my door.